As December descends upon us most normal people are thinking about Christmas and the impending holiday season, but for a few of us our thoughts are elsewhere dreaming of winter chrome. December is the start of the winter Steelheading season, as Christmas approaches the winter Steelhead start to enter their rivers and streams and as they do the anglers that are called Steelheaders start to search for the fish that dreams are made of, the winter Steelhead. Of all the many different types of fish that swim in the waters of British Columbia, Canada none are thought of or revered like the Steelhead. This is a fish that draws anglers from all over the world to come here and try to make their angling dreams come true. 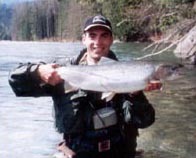 There are two different types or classifications of Steelhead in British Columbia, Canada: the summer run Steelhead and the winter run Steelhead. This obviously refers to the approximate time that these fish return from the ocean to begin their spawning run up to there home rivers. While summer run and winter run fish can be caught using basically the same techniques there are differences that can and should be considered for consistent success, the words and suggestions that follow are geared towards the ever-elusive and challenging winter Steelhead. Now that we have divided Steelhead into two distinct categories we will again divide the winter run fish into two sub categories, early run Steelhead (December, January and February) and late run Steelhead (March, April and May) While both early and late run Steelhead are classified as winter fish they definitely have a different personality and disposition towards an anglers bait. Early run winter Steelhead arrive back at their home rivers bright silver and strong from their life out at sea. When a early run winter Steelhead returns they are in the best shape of their life. Most winter fish will not spawn for at least two to four months after they have entered there home river or stream. Winter Steelhead are not in the river to feed, they will however eat selectively on perceived food items that come their way that do not require excessive amounts of energy to intercept. This willingness to feed selectively is one of the weaknesses that consistently successful Steelheaders have learned to exploit in their continuing quest to capture the mighty Steelhead. There are few things that can increase your success like time spent on the river. 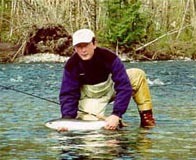 Anglers who catch Steelhead consistently spend many hours wandering up and down their favorite rivers. As the season progresses a river and the Steelhead that reside in it go through changes. Water levels, water clarity and water temperature play a major role in a steelheaders success and the approach or strategy that they will try to employ. Early season Steelhead are much more passive or laid back than late season fish. Typically the water temperature in December, January and February is on the chilly side and with steelhead being cold-blooded creatures they tend to be a little less likely to chase down or move of the bottom for any bait. Early season winter steelhead can however be caught quite readily using the right approach. The real key to enticing a fish that is not willing to move very far for bait is to make his decision an easy one and to take your bait as close as possible to him. To catch winter steelhead your bait must be fished in the bottom six inches of the river. Once an angler has identified several good runs or pools to fish they also need to know how to systematically cover these spots to find the potentially willing fish hidden within. Winter steelhead get their name because they are in the rivers in the winter time and this means that the water temp will be on the chilly side. 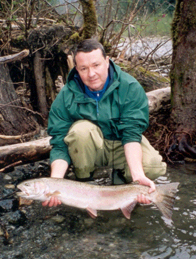 Because Steelhead are cold blooded cold water can make them less likely to move very far to intercept a bait. Always remember to have your float adjusted so that your weight makes contact with the river bottom every three to six feet of drift. Another important point to note is that river conditions will also affect where fish will hold, for example when the river is running high, fish will tend to hold lower in a pool or run and will slowly move up as the water levels fall. When a rivers clarity is poor Steelhead can sit very close to the shore and when rivers run gin clear Steelhead will hold in the deeper water farther out. To properly cover water, especially new water, you should start fishing from the top of the run or pool and work your way down. You will want to dissect the run in front of you in a grid like fashion. Basically you will want to make a short cast followed by longer cast then still a farther cast until the water in front of you has been completely covered also don't hesitate to pay special attention to spots that look extra fishy. Next take a step or two down river and repeat the whole process over. Each time you make a move down river you give your bait a new chance at a Steelhead. 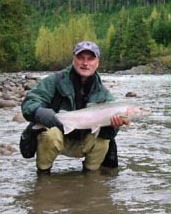 By fishing different runs or pools in this fashion you will find the preferred spots that Steelhead like to be in, and the river conditions that each spot fishes best at, hence you will find the "spot within a spot". The most common question asked by anglers who want to catch a steelhead or just catch more steelhead is undoubtedly, what is the best bait? My answer to this is that they pretty much all work. Ask 10 different successful Steelheaders this question and you will probably get 10 different answers. The one constant between good anglers is that their approach or game plan is the same. How you fish is as or even more important than what you fish. Don't get me wrong your bait, be it organic or artificial does matter, but where you fish and how you present this bait is crucial! Understanding bait presentation is extremely important but this seems to be the least understood component about steelhead fishing by most anglers. 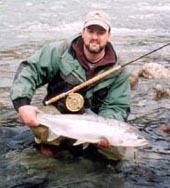 Fly fisherman use the term presentation all the time, drift or float fisherman should consider this more often. The presentation of your bait quite simply is how the fish sees you offering and does he or she find it appealing? To properly present various baits to winter Steelhead you first must have the appropriate gear. The most effective way to catch winter Steelhead is to float fish for them. While there is some personal preference that goes into gear selection for float fishing, it is generally accepted that 10ft to 13ft medium action rods equipped with level wind or single action center pin style reels are the rods of choice. Reel selection be it level wind or center pin is an anglers preference they both do the job well but the longer rods are a must to properly float fish. You need the length to keep your line off the water to properly make your drifts. If your line is in the water the current will pull it dragging the float downstream this causes a very unnatural presentation and is not very effective. Once you have your rod and reel set up you then have to concentrate on the terminal tackle or rigging. The main line, or the line on your reel, should be 15lb to 20lb test of quality monofilament. The next step is the float, not all floats are created equal. Steelhead floats come in several forms the most common and least expensive are the foam "dink floats" these floats work o.k. and don't cost much so they are the most popular. The next floats to consider are the balsa wood and cork floats. These floats are hand made and fish much better than the foam models. For the angler that has to have the best, there are the European clear plastic models these are the best money can buy, no steelhead float on the market can match their sensitivity and superior fishing characteristics. Winter Steelhead live on the bottom of the river so to get to them takes some weight; a piece of pencil lead attached to your line is all that is required. The lead should be large enough to sink your float so that only the top quarter is visible above the surface of the water. Below the pencil lead is a swivel, size 10 to 14 will do just fine. Below that is the leader to your bait. Leaders will vary in length and strength depending on water conditions; low and clear water requires longer lighter leaders in the 8lb and 36 inch range. Higher dirty water means to go heavier and shorter, 20 inches and 12lb test would get the job done here. On the business end of things is the bait and hook. Steelhead style hooks are available from several different manufactures remember that as with line you get what you pay for, there is no substitute for quality hooks. Hook size depends on couple of different factors, bait size and water clarity. In low clear water conditions small baits with smaller sized hooks in the size 4 to size1 will work well, where as in colored high water conditions larger baits and hook sizes in the 1/0 to 3/0 range will be more appropriate. As mentioned before bait selection is always a hot topic. Steelhead baits can basically be divided into two categories organic and artificial. Personally I feel that the way a bait is fished is just as important as to the type of bait that an angler chooses. Two or three different well-presented baits that match the river conditions will be successful if willing fish are present. Anglers have to be aware of the river conditions and be willing to try several baits in each spot to see what the fish seem to want on a given day. Organic baits are very productive, winter Steelhead will often fall for a well-presented piece of roe or a good-looking ghost shrimp. Single eggs tied in spawn sacks as well as prawn tails can also work well. Artificial baits are as varied as the colors in the rainbow, gooey bobs, spin n glows, Jensen eggs, Colorado blades, yarn ties and pink worms are few of the regular bits and pieces you will find in any good steelheaders arsenal. Keep in mind that the color and size selection of these items is almost unlimited. How then can any angler make a choice on what bait to fish on any given day? The approach that I have found productive is to pick three or four different baits usually consisting of one organic bait and two or three artificial baits and systemically working each one through each run or pool that I fish all day. Changing up your bait is worth the time and efforts; this can make a major difference in you success rate no question about it! Recently there has been some debate about weather or not to allow the use of organic baits for winter Steelhead. There is speculation that this encourages higher mortalities because it is thought that winter steelhead will take organic baits deeply and be more likely to expire if released. There are justified concerns where summer run steelhead are present because at times they will take a organic baits deeply but to suggest that the same is true for winter steelhead leads me to believe that the people who suggest this have either not caught many winter steelhead or they are following a private agenda. Winter steelhead, at least in my experience are very seldom hooked deeply with any bait be it organic or artificial. This may vary from area to area somewhat, but overall the overwhelming majority of fish are lip hooked and can easily be released unharmed if properly handled. Personally I feel we should work together to promote good catch and release habits among anglers and not bicker and try to add more regulations to an already confusing and over regulated fishery. As you walk up and down the rivers these days you will see more and more anglers using higher quality floats, these floats are made from balsa wood, cork and there are even high-tech clear plastic models available. Many anglers scoff at paying the six to seven dollar price tag that goes with these flashy floats. But consider this, these floats definitely have superior fishing characteristics, they make better drifts, they cast better and they even retrieve better but most of all they are way more sensitive. These floats can detect even the most subtitle take. When you consider what you have paid out for the rest of your gear and what your time is worth it just makes sense to invest a little more into the one piece of tackle that actually tells you that the steelhead you have been searching for all day is finally biting. There are many pieces to the puzzle that makes for successful winter Steelhead fishing. 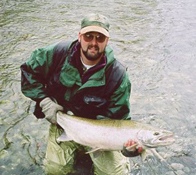 Rods and reels, lines, floats, weights, bait selection, water conditions and location are all very important but the one characteristic that all good steelheaders have in common is that they all have the ability to interpret all the different variables and make the right decisions on how, what and where to fish effectively. The bottom line is to be a good Steelheader you have to have the right attitude; you must have a game plan and be willing to put in the time, be aware of what the river and the fish are trying to tell you. Winter Steelhead fishing may not be easy but this is one of the most rewarding fisheries in British Columbia for a truly spectacular sport fish.